Here is a great craft to make just in time for this romantic holiday. It has an elegant look to it, and can be used year after year. I really like mixing in the different materials. My little boys even helped cut out the circles for the newspaper rosettes. 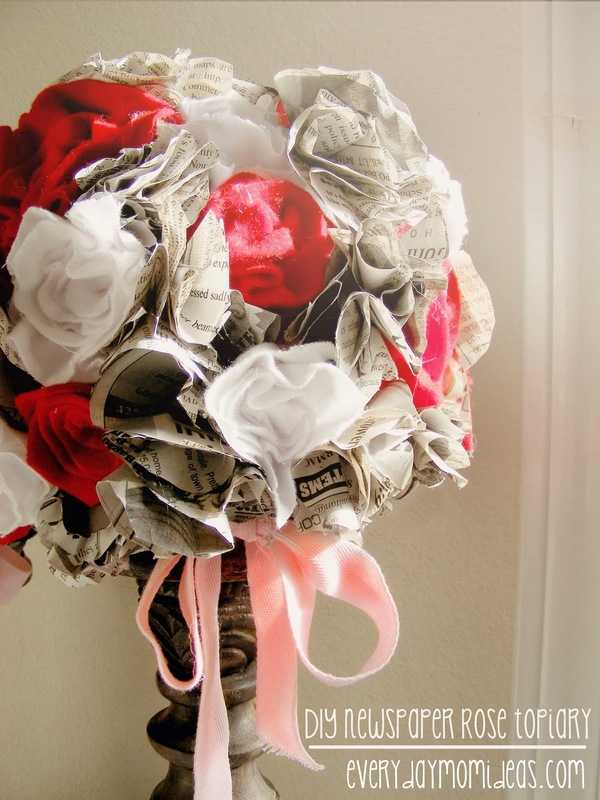 Need: 1/4 yard of red felt, 1/4 yard of white felt, stack of black and white newspaper, large foam ball, hot glue/glue gun, large/wide candle sticks, valentine ribbon. First cut a small piece off the end of the foam ball, to steady it while its resting in place. 1. Cut out four circle out of the newspaper, you can use a medium cup to trace the circle, it doesn't have to be perfect, just try to make the circle about the same size. 2. 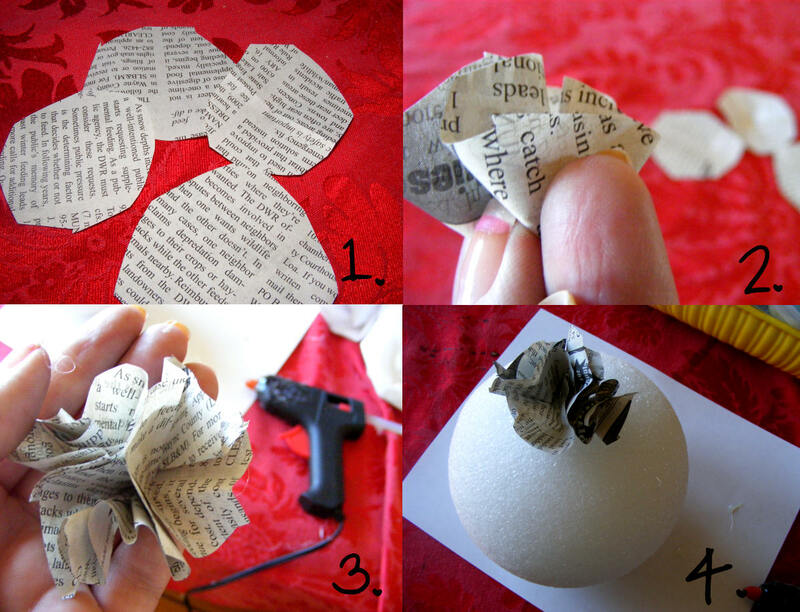 Fold each of the circled newspaper cutouts in fourths by creasing the outsides in with your fingers firmly inwards. 3. Hot glue the four creased cutouts together to form the rosette. 4. Secure rosette to foam ball by hot gluing bottom end to ball. 1. Take turns making different rosettes out of the different materials. You can get four easy different rosette tutorials here to make and add to this topiary for a stunning visual. 2. Stagger the different rosettes so that none of the same color of rosettes are touching. 3. Continue to cover the ball with rosettes. 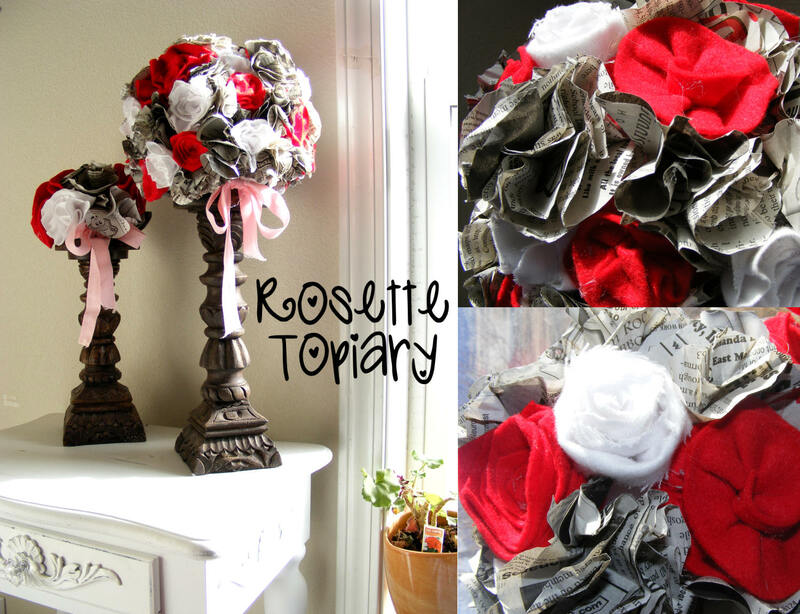 You can fill in any extra space with the newspaper rosettes. They are great to use for an easy fix. 1. Add a cute little valentine bow to give it a bit more romantic feel by hot gluing it to the bottom edge of foam ball. 2. Its all ready to prop up on some large wide candle sticks to give it that topiary look. 3. You can do so much with rosette balls, like covering the whole things and hanging it from a ceiling, or to make a centerpiece for a special dinner, or even to use if to make a bridesmaid bouquet. Ingenious idea, Julia! romantic and very pretty! Fantastic idea of mixing felt with newspaper - I love it! I love the felt/newspaper combo. It is brilliant.